The traditional development models and the market-oriented approach to poverty-eradication seem to think that poverty or prosperity is entirely an economic problem which can be solved by purely techno-economic or business methods. These methods may produce some results in the short-term or at the micro level. But for a more lasting solution at the macro level, we must address the deeper moral and spiritual causes of poverty and prosperity. This article examines some of these deeper causes and remedies. Gautama Buddha, when he saw suffering in the world asked what is in us which causes this suffering and found Desire as the root cause of all suffering. Similarly, if we ask what is the inner causes of poverty within us we will bump into a chronic dark spot in human nature. Most of us “know” it with a vague intuition. But until now, we as a race, have not yet made a systematic attempt to tackle this dark spot at the individual as well as the collective level with a conscious, planned and strategic effort. There is a lower element in human nature which is full of greed, selfishness and violence, with a strong urge for exploitation of others for its own self-interest or even if these darker elements are not prominent, there is the indifference and apathy to the plight of others. In most human beings, this lower part of human nature seems to increase and dominate the consciousness as the individual climbs the ladder of power and wealth. When the ruling sections or the “power elite” of a community, who possess, control, allocate or manage wealth resource, knowledge or power or who take or execute major decisions live predominantly in this lower nature, then most of the resources or benefits of development will be mopped up by this minority, while the majority are left high and dry in a state of deprivation or poverty. And this is one of the moral causes of poverty and equality. Some of the modern thought in the west consider this lower part of human nature as the whole of life or the life dominant element in the human organism. But the ancient eastern philosophies viewed this darker side of human nature as only a part and a lower part of the human being. There is a higher part of human nature made of the ethical, aesthetic and ideal mind and the spiritual source of our being beyond the mind. This higher nature in man is the source of the nobler values in humanity like truth, beauty, goodness, kindness, compassion, charity and when it is fully awakened and becomes sufficiently strong can effectively combat the lower nature and can even transform it. We have perhaps in our modern age sufficient material, monetary, managerial and technological resources to create wealth for the whole humanity but don’t have enough moral and spiritual resources for an effective distribution of wealth, which will eliminate poverty. As the eminent environmentalist Lester Brown points out: “modern man has excelled in production and failed in distribution”. (3) External factors like efficient distribution channels, effective laws and enforcement mechanisms, government policy in favour of the poor are undoubtedly helpful in creating a material environment favourable to the growth of equity in the outer life. But a more permanent solution to the problem of equity and poverty lies in creating a psychological environment with sufficient moral and spiritual resources which will lead to a willing and spontaneous redistribution of wealth in the society. There are four paths or methods for minimising the negative impact of this obstinate selfishness in our lower nature and awaken the higher nature in us. First is the strong arm of Law, firmly enforced against the rapacious greed of the selfish exploiter. Second, more effective, is a vigilant, honest, courageous or even militant media and social activism of mass-movements exerting an unyielding and relentless pressure for justice on the government and the selfish offender. Third, in the level of ideas and actions, every unselfish action in favour of the poor and every idea or innovation or activity which helps in uplifting the living conditions of the poor has to be regarded as a precious moral resource. Such unselfish or uplifting ideas or activities have to be consciously promoted rewarded, diffused and researched extensively on a nationwide scale. The fourth, the long-term remedy, is a new system of education with an emphasis on the awakening of the higher nature in human beings and the mental, moral and spiritual development of the individual. But elimination of poverty is only one aspect of economic development. A more positive aim of economics is to create widespread prosperity. Here comes the importance of organisation. An efficient and productive organisation is a vital factor behind prosperity. But most of the modern management thinking aims at an efficient and productive outer organization of the resources. But for a more effective organization, there has to be an equally efficient inner organization of the psychological resources of the community. The ancient Indian social thought and practice tried to achieve this inner organization by providing each individual with an outer occupation which is harmony with his or her inner psychological temperament and capacities. But in ancient India, this concept degenerated in practice into a stagnant, rigid and oppressive caste system because the occupation is forcefully imposed on the individual based on birth and hereditary and social compulsion. If we can replace this principle of birth, hereditary and compulsion with the principle of free self-discovery then this ancient Indian idea can still offer a viable psychological complement to outer organization. This means, creating a new system of education, motivation and human development strategies which provides each individual with whatever help, guidance and opportunities required for discovering his own unique inner aptitudes, inclinations, talents and capacities and express them freely in the outer life. Another factor which has to be kept in mind, which was ignored in the Indian idea, is that a human being is an evolving organism and therefore human nature is not something fixed and rigid. As we evolve and progress inwardly and outwardly new faculties, inclinations and motives emerge and the outer organization has to be flexible enough to accommodate and express this progressive evolution of the individual. If we can implement this freer and more flexible and progressive version of the Indian idea in education, administration, organization and other developmental activities, it will lead to an efficient and equitable distribution of the psychological resources of the community. This in turn will have its beneficial impact on the economic and social life in terms of equity, employment and income. But the greatest of moral and spiritual resources bequeathed to humanity is the spiritual discovery of ancient Indian seers of the indivisible oneness of all existence and the unity and interdependence of all life. Modern physics and ecology corroborates these highest laws of life in the physical and biological level. But in the Indian perception, this law of unity is in its essence a spiritual unity of consciousness which exists and can be felt in the inner most depth of each human being. The physical and biological unity perceived by modern sciences is only a reflection of this inner unity of consciousness in the world of matter. 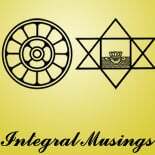 If this inner unity of life can be made fully conscious and living in the mind and heart of humanity and established in the consciousness of the race as an experiential reality, then every inner and outer problem we are facing now like violence, poverty and inequality will find its spontaneous solution. For when I can know, feel and experience all others and the whole creation as a part of my own being in the universal oneness of my own self, and others’ well being as part of my own well being, then I no longer need any conscious morality or ecology. All my thought, feeling and action, proceeding from this unity-consciousness will be spontaneously and unselfconsciously moral and ecological, which means for the good of others and the well being of the whole. But this is a long-term solution which can not be immediately actualized. But we can prepare our inner and outer life for this ultimate solution through education, thought and culture. First of all, the thinking mind and emotional being of man have to be awakened to these laws of unity through education. And the pragmatic implications of this law for action, behaviour and decision making in the economic, social, political and cultural life of the race, have to be extensively researched and debated and whatever consensus we can arrive has to be institutionalized. We have to evolve an inner discipline by which each individual can discover and experience this inner unity in the depth of his heart and this discipline has to become an integral part of education. If we can develop and establish this culture of unity in the consciousness of humanity, then we will be creating a precious inner resources and a psychological environment in which all our inner and outer problems—economic, social or political—will find their permanent solution. This entry was posted on January 25, 2015 by integralmusings in Society & Culture.